This post and giveaway is sponsored by Purina. As always, we only share information we think our readers will enjoy. More than half the dogs and cats in the Unites States are overweight or obese, a statistic we've become all to familiar with in the last few years. Yet with all the hype about pet obesity, it amazes us that so many people still don't know that their Fluffy or Fido is overweight. And that's pretty scary when you consider what a few extra pounds can mean for the health of your pup or kitty. In a groundbreaking 14-year Purina study, findings showed that feeding dogs so that they have the proper proportion of fat to muscle (ideal body condition) throughout their lives can significantly extend a dog's healthy years by an average of 1.8 years for the dogs in the study. Fortunately, weight is a condition that can be managed with a low calorie, low fat diet fed at the right amount, combined with adopting some healthy habits. Purina® ProPlan® Veterinary Diets offers these tips on healthy living and how to properly assess your dog or cat’s weight. How do you know if your dog is overweight? Start with a Healthy Hug! A simple rib check is a great way to determine if your dog has a weight issue—and it’s a great excuse to give him an extra hug today. Consult your veterinarian about whether a weight management program is right for your dog. You and your veterinarian can create a nutrition plan that feeds your dog to his ideal body condition. Refer to the feeding guidelines on your package and adjust feeding amounts as necessary based on your dog’s activity level and body condition change. Don’t just fill up your dog’s bowl at each feeding. Follow feeding guidelines to give your dog the proper-size serving for his ideal body condition. Shower your dog with love and attention instead of too many high-calorie treats, especially table scraps. Be mindful of the quality and quantity of treats you feed each day—calories add up quickly. 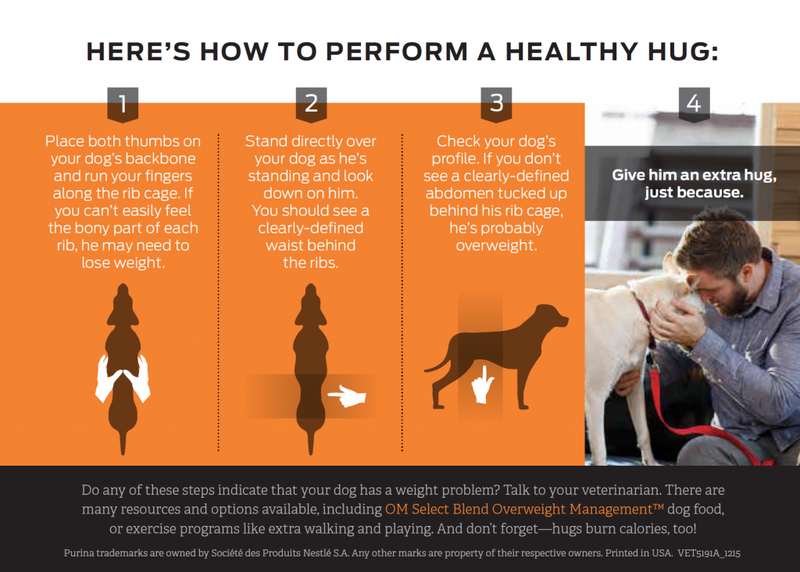 Even if your dog is overweight, there’s still time to implement a safe, effective weight loss program with Purina® Pro Plan® Veterinary Diets OM Overweight Management® Canine Formulas. These specialized formulas contain a high level of protein to help your adult dog lose fat while maintaining lean muscle mass. And, there's a formula for cats, too. One lucky winner will receive a coupon for a free bag of Purina Pro Plan Veterinary Diets OM Overweight Management to help your dog or cat get to his ideal weight. NOTE: coupon will need to be redeemed at a vet clinic. Value up to $60. Enter via the giveaway widget below. Good luck! i watch my girls weight very carefully. i check their sides to see how much i can pinch and if i can feel their ribs. i also look down on them or see if they are carrying a belly, then it is diet time. i dont feed a lot of treats. if we go to an event where they get lots of goodies, i cut their meal in half. they get lots of exercise, running, playing, training. i make sure they have a figure. I have reduced the amount of food I feed over the life of my dogs. As they age their nutrition needs change and so should their food. exercise is key to a healthy dog too. I have three rescued Treeing Walker Coonhounds. My Kyoko had almost been starved before being dumped at a kill shelter in SC. She was just skin covering bone when she got to me and I worked on getting her to gain weight. Unfortunately, she seems to still think she's starving, even though she gained TOO much weight and I have had to work on getting her to lose some. She should weigh no more than 60-65 pounds and was up to 79. I've gotten her to lose a few pounds by giving her a lower calorie diet, watching what she eats (she'll inhale any food she can get her mouth on, including that for her two brothers, and I use a slow feeder bowl to get her to slow down, too), and taking her for more walks. So far she's lost some, but I'd really like to get her to lose another 9 pounds. She's smaller than her brothers, so should weigh less than them, and not the same. Schooner is overweight. We are walking 2 times a day and do lap in our pool. We need to change Schooner's food. It is grain free but this last bag I brought is very high in calories so we have cut the amount of kibbles. Schooner eat raw too. Skipper his brother is helping because Skipper is very active and a little hyper which he is trying to get Schooner to chase him outside along with playing tug of war. My honorary Havanese performed so well at our Obedience classes several years ago. She would do anything for treats. Unfortunately, I did not cut back enough on her normal meals while adding the treats to her diet, so she gained some weight. It has been hard to take that weight off her. We walk farther than before, have fewer treats, and have smaller meals, and the weight is slowly coming off. Got mine in an agility class. He's an all-in-one picky eater, snobbish, lazy dog but he'll also do everything to get the treats. I'm currently working up to bring back his appetite in eating food with a high health value. I have decreased the amount of treats that I give my dogs and sometimes I give them veggies. My vet recommended green beans. My dogs are both at healthy weights, though Wager will need to loose just a little bit more when he starts agility. They get lots of exercise and I'm careful to adjust meals to balance the treats used for training. Feeding the proper portions and getting exercise is how we try to stay in shape. The heat has really cut down on our walking though. Less treats and more walks! Just like with humans, weight is something you need to constantly monitor, exercise, age, and health constantly change how much a pup needs to eat. I plan to measure her food better and watch how many treats she gets and get her exercising more because she is very lazy. Thankfully both pups are in their right weight thresholds. We plan on maintaining that with continued exercise, and regulating their food and treat portions. They stick to a strict diet. I measure their food and they get very few treats. Funny how most people are having hard time controlling their dog's appetite yet I am here having an headache on how to encourage my pit to have such a booming appetite. We takes walks every day to help maintain weight. They also play with each other, so that is some exercise also. Less treats and better treats (they like carrots) and more walks. The healthy hug is a great way both to show your dog affection and keep an eye on their weight. Weight management is important and certainly should not be ignored. Shunta is old so going for little walks. I also am giving her senior dog food. We really are going to have to feed them separately if Bear is ever going to lose the weight he needs to lose!Lady the lab mix only eats when she's hungry and isn't overweight at all, but our Pit Bull, Bear, will eat anything and everything! Lots of exercise and watching what they eat. We have been doing portion control, using lower calorie treats and staying active. we keep their food portions down and make sure they get good exercise. it's really not hard to keep them regulated. i wish someone would do the same for me, LOL. This is as important to look after as we do for our child. So we should encourage people to have vet doctrolship. The personal statement vet school is now available for all students who have interest. i am agreed this place is very nice and good application our game.full information.this website. get robux . just use the this website.